KODIAK, Alaska -- In a business where mission costs are often measured in billions of dollars, the $170 million value of Friday's rideshare rocket launch from Alaska seems like a bargain. It is, according to U.S. Air Force officials. The Minotaur 4 launch vehicle is mostly powered by leftover solid rocket motor stages from the retired Peacekeeper ballistic missile. Its fourth stage and a hydrazine kick thruster are derived from the air-launched Pegasus rocket program from Orbital Sciences Corp. The 78-foot-tall rocket has an hour-and-a-half Friday to lift off from the Kodiak Launch Complex. The launch window opens at 4:24 p.m. Alaska time (8:24 p.m. EST; 0124 GMT Saturday), just before sunset at the state-owned spaceport. Instead of a nuclear payload, the tip of the Minotaur holds seven satellites, each packed with experiments, to be be released one-by-one in orbit 400 miles above Earth. "On this single rocket, we will launch seven satellites carrying 16 science and technology experiments from the Air Force, Army, Navy, NASA and the National Science Foundation," said Col. Carol Welsch, director of the Space Test Program, the division overseeing flight opportunities for emerging new technologies. The satellites cost about $120 million, and the cost of procuring and launching the Minotaur 4 rocket is $50 million, according to the Air Force. The Air Force has not released a timeline of the rocket's flight sequence, but it will take about a half-hour for all of the spacecraft to be cast free of the Minotaur fourth stage. The Minotaur will fly southeast from Kodiak and reach an orbit with an inclination of 72 degrees. Friday's launch will be the third flight of the Minotaur 4 rocket. A suborbital mission in April launched a hypersonic testbed and a Minotaur 4 placed a space surveillance satellite into orbit in September. It will be the first Minotaur flight from Kodiak and the second orbital mission from the Alaska spaceport. 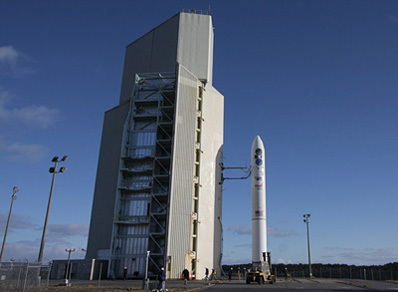 Owned and operated by Alaska Aerospace Corp., the Kodiak Launch Complex was the site of a similar multi-payload mission in 2001. Unlike the two previous Minotaur 4 launches, this mission will test the Hydrazine Auxiliary Propulsion System, or HAPS. After the Minotaur's payloads separate, the liquid propulsion system will raise the rocket's altitude to 715 miles and release ballast weights to verify the thruster could haul satellites to different orbits on future flights. "This is an exciting launch for us because we're going to add the new capability with the HAPS upper stage, which enables us to go to multiple altitudes, so that small satellites can get together and share a mission," said Lou Amorosi, the Orbital Sciences senior vice president responsible for the Minotaur program. Artist's concept of STPSat 2 in orbit. Credit: Ball Aerospace and Technologies Corp.
STPSat 2 is the mission's prime payload, carrying two top-priority investigations from the military's Space Experiment Review Board rankings of the most urgent technologies ready for flight demonstrations. The Space Phenomenology Experiment, the No. 1 ranked SERB payload, will test the compatibility of sensors in the harsh environment of space for potential applications on future responsive satellites. An on-board communications link will also relay data between ocean buoys, terrestrial stations and military users, proving techniques for downlinking text messages to U.S. Army mobile units, according to the Air Force. The STPSat 2 lead contractor is Ball Aerospace and Technologies Corp, and the spacecraft bus was manufactured by Comtech AeroAstro Inc. It is the first of up to six so-called standard interface vehicles, satellite buses that support the rapid attachment of up to four standardized experiments for flight demos. "The beauty of the responsive spacecraft bus used for STPSat 2 is its ability to accommodate a broad range of payloads," said David Taylor, president and CEO of Ball Aerospace. "The repeatable design provides low cost space access for the Air Force while accelerating the build schedule and reducing risk." Measuring about 2 feet on each side, the cube-shaped spacecraft features deployable solar arrays and can launch on small Minotaur rockets or as a secondary payload on more hefty Atlas and Delta rockets. Design and production of the standard STPSat bus began in 2006. The project's goal is to cut the cost of access to space for blossoming new technologies critical to advancing military capabilities. NASA's contribution to Friday's launch is FASTSAT, another low-cost satellite loaded with novel sensors and experiments itching for a ride to space. 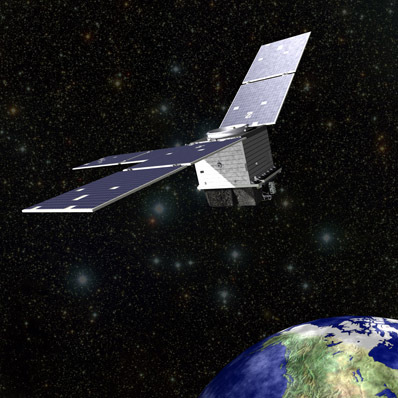 FASTSAT houses three atmospheric and space weather payloads from NASA's Goddard Space Flight Center and the U.S. Naval Academy. A threat detection system and miniature star tracker are also aboard FASTSAT from the Air Force Research Laboratory. The spacecraft will eject a 8.5-pound subsatellite named NanoSail-D about a week after launch. NanoSail-D will unfurl a 100-square-foot solar sail to verify deployment mechanisms for future missions that could clear space debris from busy orbital lanes. Developed for less than $12 million, FASTSAT stands for Fast, Affordable, Science and Technology Satellite. It was built by engineers from Marshall Space Flight Center, Dynetics Inc. and the Von Braun Center for Science and Innovation, all in Huntsville, Ala. The FASTSAT project includes contributions from 13 local Huntsville firms. Three university satellites are also packed inside the Minotaur 4 rocket. Two FASTRAC satellites from the University of Texas at Austin will test autonomous formation-flying through crosslink communications and GPS navigation. One of the spacecraft also carries a micro-discharge plasma thruster. The Formation Autonomous Spacecraft with Thruster, Relnav, Attitude and Crosslink, or FASTRAC, program was selected by the Air Force's University Nanosat Program in 2005. More than 100 students worked on the FASTRAC satellites, which have a combined mass of more than 120 pounds at launch. The spacecraft will split up and perform formation demonstrations pivotal to future space research missions. 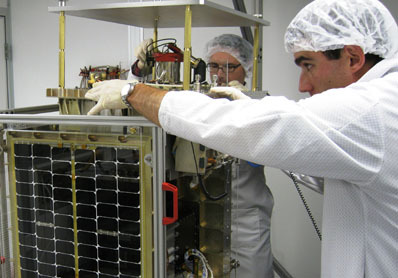 FalconSat 5 is a cadet-built spacecraft from the U.S. Air Force Academy. Two payloads on FalconSat 5 include a small Hall Effect thruster for attitude control and an electrostatic analyzer/spectrometer suite to observe the effect of thruster plumes on the surrounding space environment. The $11 million mission began four years ago and is managed by the Air Force Research Laboratory. FalconSat 5 will also monitor ionospheric effects on radio communications. Workers attach the FalconSat 5 plasma thruster to the spacecraft. Credit: U.S. Air Force photo/Maj. Steve Hart. 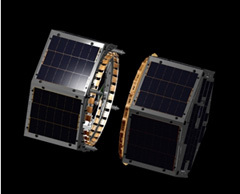 The Radio Aurora Explorer will ride to space inside a P-POD deployment mechanism. About the size of a loaf of bread, RAX will detect radio signals scattered by the ionosphere to enhance the scientific understanding of aurora formation. RAX is a joint project between the National Science Foundation, the University of Michigan and SRI International. A NASA CubeSat named O/OREOS is carrying a plethora of organic specimens to test their reaction to harsh radiation in orbit. Separate sections of the tiny satellite contain microorganisms and organic molecules to be exposed to stresses of the space environment. "This research can contribute to our understanding of the environmental limits (of life), and it drives many aspects of life sciences and also planetary protection issues," said Pascale Ehrenfreund, O/OREOS project scientist from the Space Policy Institute at George Washington University. O/OREOS builds upon experience at NASA's Ames Research Center on GeneSat and PharmaSat, two similar missions launched in 2006 and 2009. "We're pushing the limits and trying to see what advantages we can take by making things small, low-cost, and having the ability to have them launched on a frequent basis," said Bruce Yost, O/OREOS project manager at Ames.